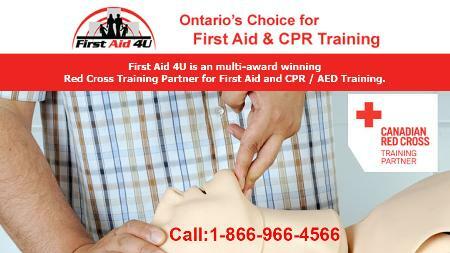 First Aid and CPR Training Classes provided by First Aid 4U. First Aid 4U is an Award Winning Red Cross First Aid and CPR Training Partner offering WSIB approved Standard First Aid, Emergency First Aid training, CPR and AED Certification courses with Red Cross certification in London, Ontario. Workplace and Corporate First Aid specialists. We also offer an extensive line of WSIB First Aid Kits & supplies. Our experienced Red Cross First Aid Instructors have taught thousands throughout Ontario.